It’s been a busy term for the Huddersfield Choral Youth Choirs this autumn with learning new music and recruiting high on the priority list. We were at the freshers’ fair at the University of Huddersfield in September giving out Haribo, lanyards and totting up the signatures. Despite taking on some new members over the summer, we’re still on the lookout for young and enthusiastic new members, particularly boys! The Young Voices were in action in the week before October bank holiday sporting their snazzy new uniforms. The young guns were in fine form at the Holmfirth Music Festival, finishing first! It’s a fantastic achievement for the Young Voices after their successes earlier this year at the Mrs Sunderland Festival in the Huddersfield Town Hall. It’s also been a busy term for the fundraising side of the choir. A race night, organised by Steve and Carole Kain took place this term. Just to explain what a race night is for those that don’t know: A board with six horses on it, each allocated a number, move along from start to finish. When the number allocated to the horse is turned over, that horse moves one place until there is a winner. Of course, if you have backed that horse before the race, you win. There were seven races in all and the competitiveness was reaching sky-high levels by the end with so many 50ps on the line. The evening wasn’t just about the fundraising however, the event was great fun for all who attended. Some people even left with some profit in their pockets! We’re also very excited about the impending broadcast of our episode of ‘Creeped out’. For those who can’t remember or didn’t know: A small section of the Youth Choir bussed their way over to Bolton and took part in a day’s filming for a new CBBC show. Now, having heard back from the production team, we know that the show will first be broadcast on Halloween (which is appropriate, as the show is going to be spooky viewing). The members of our choir will feature in the third episode of the 13-part series which will be broadcast on 14th November at 7pm on the CBBC channel. We’re all very excited about our impending TV appearance. Keep an eye out for choir helper John Moran and MD Alison North making cheeky guest appearances! The acting may not be the finished product but the singing most definitely is. A new season of singing is upon us! At the end of a fantastic year topped off with brilliant 30th anniversary celebrations, a new season of singing is upon us! We saw the last season out in style with a wonderful send-off for our long-standing (literally!) Musical Director, Susan Wilkinson. Susan was involved with the choirs since their inception, and worked hard across many years to nurture young people’s voices and give them the confidence and skills to perform to a very high standard. 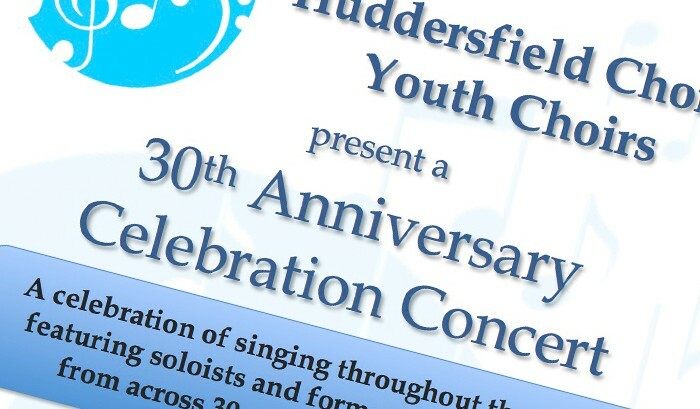 Many choir members spanning the full 30 years convened at our anniversary concert on July 9th at Huddersfield’s Holy Trinity Church to showcase the skills, dedication and love for music and singing that began as a result of their involvement with the choirs. The concert was a triumph and served as a true illustration of Susan’s legacy. We cannot thank her enough for her hard work and dedication from her first day with the choirs to her last. In recent months, the Huddersfield Choral Youth Choirs have undergone something of a transformation, with a new name, logo and a swanky new website! Over our 30-year history, the choirs have sung in different sections and been known by several different names. 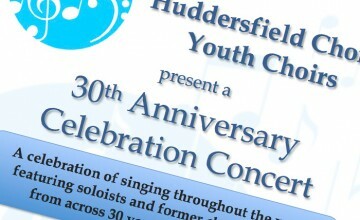 Until 2006 the Youth Choir and Children’s Choir (as the Young Voices were then known) functioned for the most part as separate choirs, coming together to perform special concerts as well as with senior choir, the Huddersfield Choral Society. In 2006 the choirs came together to rehearse on the same evening and in the same venue, headed by Musical Director Susan Wilkinson, and were known as the Huddersfield Choral Society Junior Choirs. In our 30th year, it seemed only fitting to relaunch the choir brand, and we are proud to go into our 31st year under the new ‘umbrella’ title of the Huddersfield Choral Youth Choirs.